A Beary good day with 10 bear sightings! After a long night in the tent we were ready to have breakfast by 6:00. It was a short paddle to Ricky’s place, unfortunately he was not there. Ron and Sue, a couple from Minnesota, were there drying out their gear in his cabin. Ricky had a very neat and organized cabin. Ron thought that he might have been a missionary. Many spiritual quotes were on his walls. 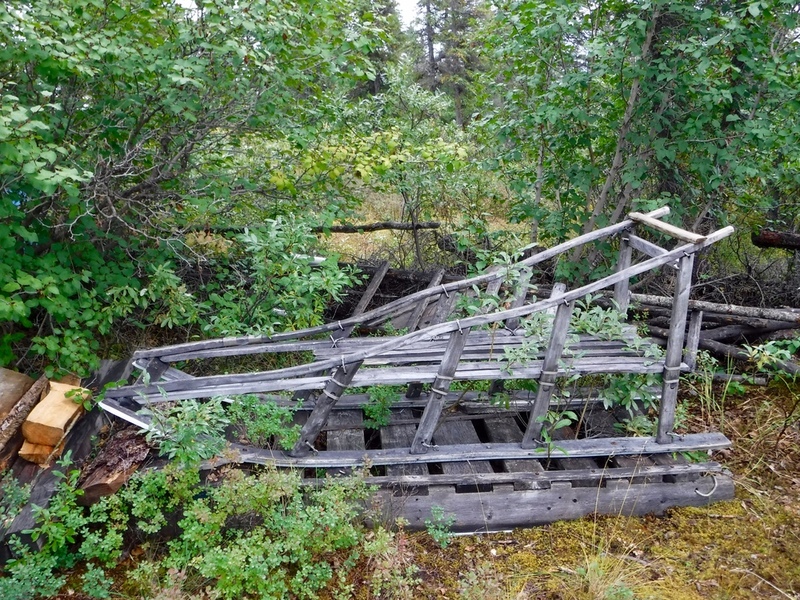 Outside he had built a cache, a permafrost food storage shed, a sauna and a wood shed. He has a house in Noatak but spends a lot of time here. After an interesting conversation with Ron about the Caribou herds of the Northwest Territories, we left the cabin and headed into the best bear watching part of the trip. We saw bears swimming, a sow and cub walking along the shore and then came the best sighting yet. 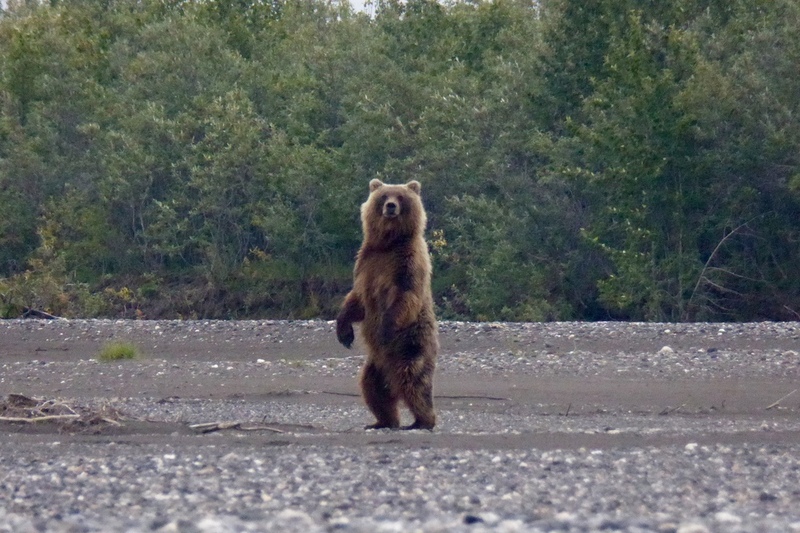 A large bear was eating a salmon and as the river took us closer she stood up and gave us quite a look. Unlike the other bears who ran away after standing up, she started running towards us. Soon though we saw the reason. There were three cubs near by. She ran toward them rounded them up and off they went. We were glad that we had not gotten between them. Lots of salmon were jumping and the river was a maze of channels. Many places were quite shallow and most of the time we were able to follow the deepest channel. Several times though it was time to hop out of the boat and pull it over the shallows. Our bear senses were on alert during these times. Another wet night. We had a four foot rise from our tent to the water’s edge, but I woke up several times during the night to check out if the river had risen. We did not have a good escape route and I kept running the what if scenarios in my head. At 5 o'clock I did a check and learned that my worries were in vain. We both slept in till 8 and then as the rain continued to pour we elected to have a reading morning. When a break in the rain came we quickly got out of bed and broke down camp and had breakfast. Fortunately the wind had picked up and the biting gnats got blown away from us. An eleven o'clock departure was our latest yet, but with a stronger current we are still averaging over 28 miles a day. Scenes around us are always changing. Today we paddled through the Noatak Canyon. It was quite spectacular with rocks being uplifted and swirled in many directions. A rapids that poured over a ledge presented no problem as the water level created more noise than wave action. Tomorrow we are planning on stopping at Ricky Asbury’s cabin. We found a great spot that we could nestle a kitchen between the rocks. We were glad we stopped when we did as the rain and wind picked up. It was a short day on the water with plenty of reading in the evening and morning. WET! WET! WET! After the warmest, sunniest day of the trip and the skies being so clear we opted to not set up the tarp. Mistake! It started pouring during the night and continued all day. Packing up in the rain we were on the water by 9:30 and soon afterwards a bear swam across the river in front of us. It was impressive of how easily he dealt with the depth and current of the river. We gave him plenty of room as we paddled by him. HIgh on river right we noticed an orange tarp and two Alley Pak canoes. We shouted Hello and two ladies came to the bank and motioned for us to come over. They were a group of four. Two were from Germany and two were from the Netherlands. They invited us for tea and good conversation followed. They were having a layover day to celebrate one of their party's birthday. The current in this stretch of water was quite fast so we felt that we were moving along at a good pace. A large adult bear checked us out before showing us his powerful run up the mountain. One could see the muscles under his fur moving as he ran. We found a gravel bar with good height and made dinner. The wind died down and we had our first encounter with small biting gnats. We retreated to the tent and watched them on the outside of the netting. The sun greeted us this morning with brightness and warmth. On the water by 9, it was a short paddle to the tusk site. 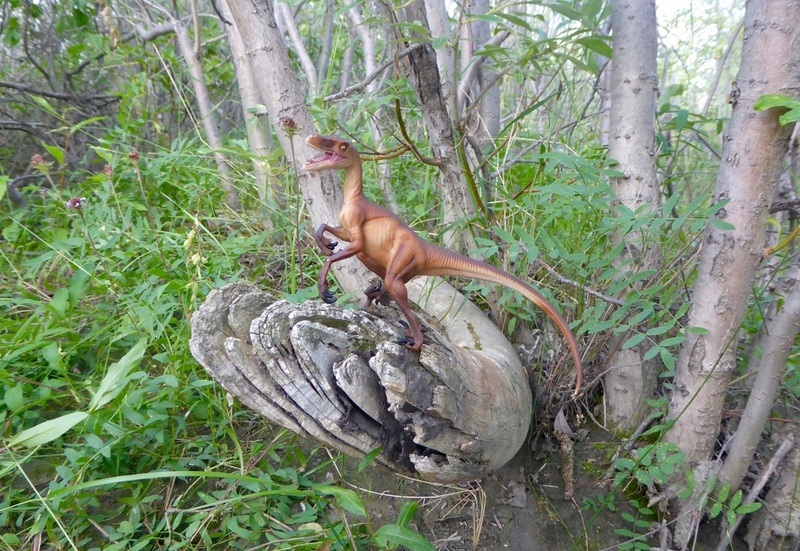 Using Alan’s map, Don located the tusk weaved between several alder bushes.The fossilized tusk was huge and heavy. It was interesting thinking about the animal that had lost its tusk. After doing the photo ops we returned it to its site awaiting the next informed paddlers. The sun continues to warm up the air allowing us to remove a layer. Finally a day where even my feet feel toasty. The river has dropped about a foot and is running clear again. Don sees something moving along the shore, as we approach a small black wolf cub stands and stretches. He watches us for several moments before sauntering into the brush. Further down the river we see our first cub. Mom is fishing and successfully snags a salmon. They share the fish until she notices us and decides to head up to the top of the ridge. Several times during her accent she stops to look at us. The fireweed along the shores is ready to send forth its seeds, probably meaning that winter will soon be approaching. A jet flew over today, the first one we have seen since starting our trip. 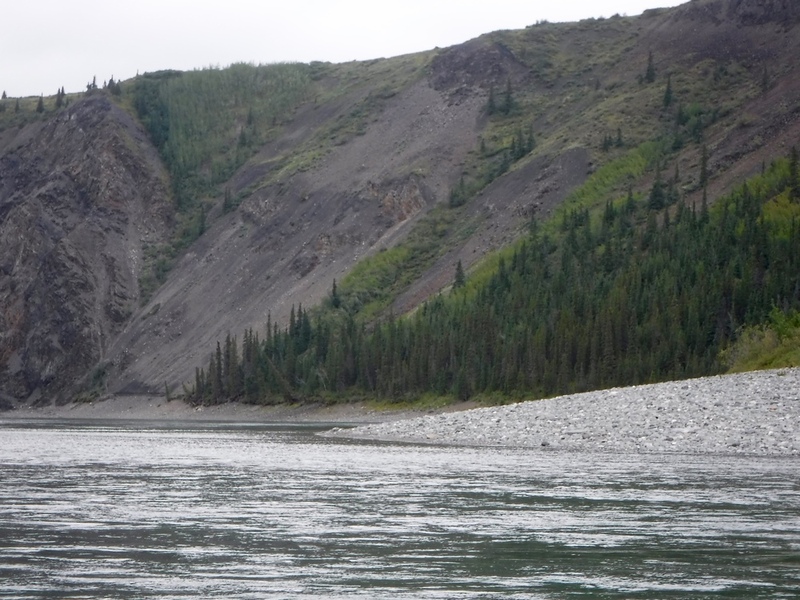 We find a nice gravel bar that unfortunately is covered with bear tracks, however as we are seeing more salmon we doubt that we will find a gravel bar without tracks. A sunny day provides us with the opportunity to organize our food for the next 10 days. Some gusts of wind encourage us to secure the Alley Pak. Quite windy last night as our tarp did not make it upright by morning. We feel blessed to be surrounded by so many beautiful birds and vistas. Today we had gulls, loons, ducks, rough legged hawks and peregrine falcons visit us. A group of twelve musk oxen were seen in a protected area that was sheltered from the wind. We stopped at a site near where Alan Coulter had drawn us a map to find the Mammoth Tusk. Unfortunately when we tried to access it this evening, we were stopped by water. We will have it on the agenda to look first thing in the morning after we pass the small outlet. Dino almost got lost last night as I (Donna) laid him down and did not pick him back up. Fortunately, in retracing our steps, there he was. That was a relief as tomorrow hopefully he will see a kin. We are using a stove that Jeff had cleaned over 10 years ago when he was helping out at NOLS. MSR stoves are impressive. Blueberry scones and blueberry chocolate pudding were on the menu tonight. We were a bit sugar overloaded.